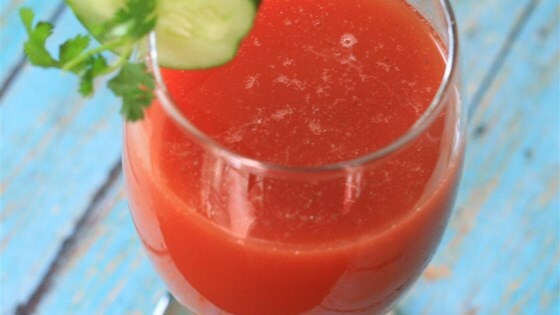 "Delicious tomato juice for a fraction of the cost of store-purchased. Adjust lemon, salt, and sugar to taste. Almost 7 cups of juice for about $1.00! I prefer the natural tomato paste." Blend 2 cups water, tomato paste, lemon juice, sugar, and salt together in a blender until smooth; pour into a 1/2 gallon container. Stir 3 cups water into mixture. Refrigerate until thickened, about 1 hour. Add 1 more cup water if juice is too thick. Fresh homemade tomato sauce is easy and deeply flavorful. I don't even like tomato juice, but I found this delicious when I made it today. Love this recipe! Have made it multiple times. It's light and makes. A good mixer for bloody maries! When I developed this recipe, tomato paste was much thicker. I would now recommend cutting the water down by one full cup.